Harbor is a nautical nature name with a subtle virtue vibe. Could it catch on? 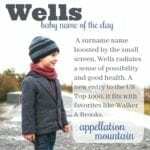 Thanks to Caitlin for suggesting our Baby Name of the Day. The word originally referred to temporary quarters for people – an army’s camp, for example. But by the thirteenth century, a harbor also referred to a naturally occurring shelter for ships along the coast. This makes it something of a nature name, though it’s been possible to artificially construct shelters for centuries – and often a port, for loading and unloading cargo from ships, is constructed within an existing harbor, adding additional safeguards. It’s been a verb since at least the 1300s. And at some point, it became possible to harbor thoughts instead of physical things, like men and boats. 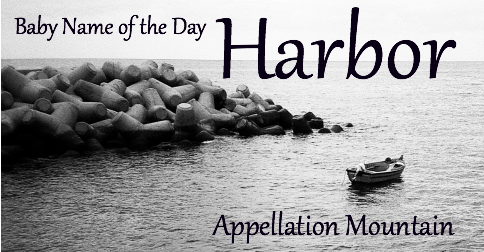 Harbour is the British English spelling. Both spellings sometimes appear as surnames, sometimes occupational names for someone who operated a boarding house or inn, from the word’s older sense. A ship at harbor is safe, protected from storms, sheltered in the calm waters. That’s why this name takes on a virtue vibe. Virtue names aren’t new. Some, like Grace, have long histories of use. Others feel a little more obvious, tied to the Puritans, though Prudence and Mercy have both attracted interest in recent years. But there’s a whole class of modern virtue names, and Harbor belongs in their company. Chance, Haven, and Journey have been popular in recent years, with names like Valor and True attracting attention, too. Most of these are at least potentially gender neutral, though use tends to divvy them up – Chance is almost certainly a boy, Haven is likely to be a girl. If the names’s virtuous vibe doesn’t appeal to you, maybe its status as a place name will. Many of the world’s greatest cities have been built around a naturally occurring harbor: New York, Boston, Baltimore, San Francisco, Amsterdam, Istanbul, Havana, Lisbon, Buenos Aires, Vancouver, Jakarta, Genoa, Gdansk, Sydney, Saint Petersburg, Tokyo, Mumbai, Nassau, Norway’s Trondheim, Jamaica’s Kingston. I’m leaving off dozens and dozens more, but what it all means is this: it’s very possible to take inspiration from one of the countless places around the globe. But is anyone actually using this as a name? Yes – but it’s quite rare. Harbor was first given to more than five children in 2006. By 2014, there were 39 girls and 26 boys by the name. Perhaps it trends slightly feminine because of the popularity of H surnames for girls, like the very similar Harper. (And I think the potential for confusion with Harper is a concern.) I’m inclined to give this one to the boys, though Bay and Ocean feel perfectly unisex to me. 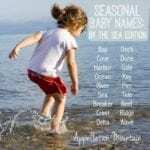 With ties to the natural world, a tremendous number of noteworthy places, and a virtue vibe, it’s easy to imagine bold baby namers embracing this word as a child’s name. And we could be just one fictional character/child star away from this one catching on. What do you think of Harbor? Do you think it works as a given name? My granddaughter’s name is Harbor because her mother’s name is Ocean. 🙂 Harbor was born in Nov 2016 and she’s the only Harbor I know. 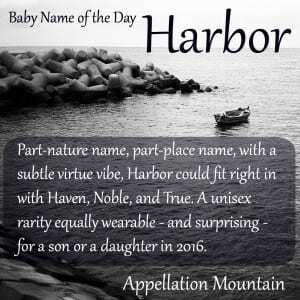 I love the name Harbor and used it for my precious little girl born in June, 2015! Not only does it fit her perfectly, the uniqueness of the name is fantastic and her last name also has a nautical related definition. I wouldn’t change it for anything and cant think of a better name for my unique, outgoing and ‘safe’ little princess. I am so excited you have covered this name finally – I think you suggested it in another post which I read when pregnant. I liked it as a “safe place” name, akin to Haven, and if she was a he I like with the potential nickname Harry. I subsequently had a girl and Harbour (as a middle name) was born. It’s raised a few eyebrows but I don’t care and I think she will love our reasoning someday ad it sits beautifully beside her other two names. I hear you Abby! Our little boy is called Iden and we didn’t think at all about how (to some people) it would sound like Aiden. It doesn’t happen all the time but enough that I have had to correct people on occasion (or just keep referring to him as Iden until they realise). It doesn’t really bother me, but I hope it doesn’t end up being a burden for him. Once they get it, almost everyone is fine, but I do have a colleague that still refers to him as Aiden (almost 3 years later!). We still love the name but I guess it’s a risk when similar sounding names are so popular!